There are certainly mixed feelings when it comes to fondant. I am not sure if this is because people find it difficult to use, it does not look as "yummy" as fluffy buttercream, it tastes funny, or whatever. In my humble opinion, there will always be a place for fondant. Maybe not for every event or design, but it is certainly worth giving a try. It may take practice to handle efficiently, but it yields beautiful, smooth results - even producing designs that cannot be achieved with any other medium. Today, I am happy to share some tips and tricks in this Fondant Tutorial. There are several websites, blogs, youtubes, etc with excellent how-to guides out these, so feel free to read around. However, after working with fondant for the last 7 or so years, these are some of my most valuable words of advice. This might not be the most comprehensive list, but it is a good start, guaranteed. Speaking of a good start, do check out my post on how to ice a cake before you get started. One thing that I can't stress enough is that a well built and iced cake will alway yield the smoothest fondant-covered cake. 1. If you are using pre-made fondant, make sure to taste-test it. If you don't like the taste, it will not get any better once on the cake. Not all brands are created equal. So for anyone that says "I hate fondant," you might want to use a different one. 2. Nothing beats the consistency of fresh, white fondant straight from the tub. However, if you are adding color and kneading more than normal, be sure to balance it by adding shortening and cornstarch to keep the fondant from drying out or getting too sticky. 3. Speaking of kneading, make sure to condition your fondant before you roll it out. Once you have sliced a chunk off to use, start kneading it to form a smooth ball. Try not to incorporate too much air by over-kneading, or it will dry out faster. If you are in a dry climate, add a bit of shortening to the fondant. If you find that the fondant is sticking to your work surface, you will want to dust the area with cornstarch. 4. After the fondant is "conditioned," pull the sides under to make a smooth ball on top. Flatten out slightly to form a smooth disk. 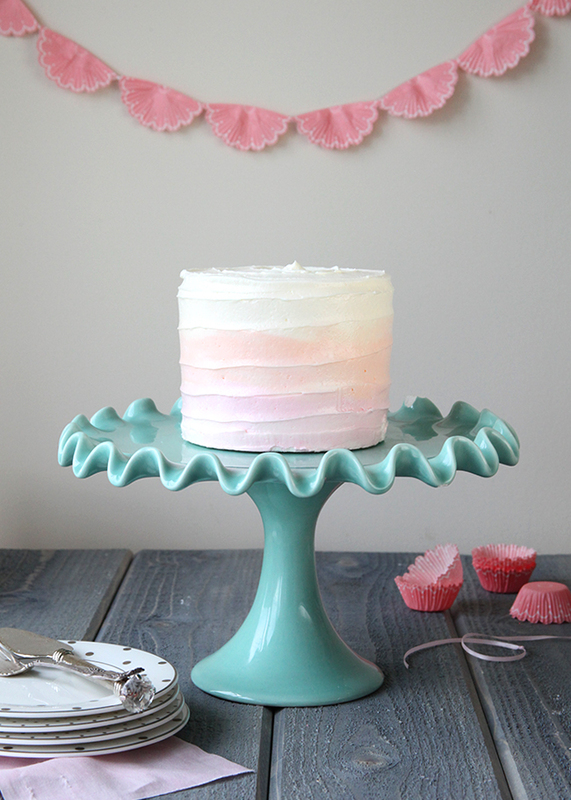 If you are covering a round cake, it makes sense to start with a round piece of fondant, right? 5. Lightly dust your work surface with cornstarch before rolling. Starting from the middles, begin rolling out your fondant in one direction (up and down), but not all the way to the edges. The middle will start to flatten, but keep an inch or so on the sides "puffy." 6. Rotate your fondant 90 degrees and begin rolling the other way. At this point, you will then flatten out the ridges that one were once on the sides. Keep rolling using even pressure and trying to keep a round shape. Rotate your fondant every so often to make sure it is not sticking to the bottom. 7. Roll out fondant until it is about a 1/4 - 1/8 inch thick. 8. Before placing fondant on the cake, give it a good look. Check for air bubbles, irregularities in thickness, size, etc. If there are small air bubbles, "pop" them with the tip of a craft knife or straight pin. 9. Lastly, use your fondant smoothers before moving the fondant to the cake. This will give it a nice "buff," smooth out minor bumps, etc. 10. Carefully lift one edge of the fondant and drape it back over the rolling pin. Use the rolling pin to lift the piece off of your work surface. Place and unroll evenly over the top of your cake. 11. Being sure to work quickly, smooth out the fondant on the very top of the cake first, eliminating any air pockets. 12. Secondly, adhere the fondant to the edge and tops of the sides. 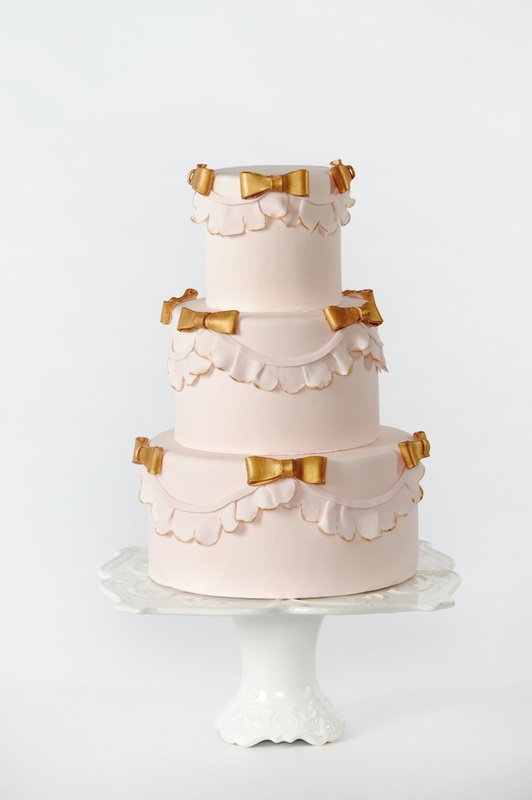 You will want to use the most care here to make sure you have a nice, clean edge and that the weight of the fondant does not pull the fondant down the sides and tear the top. 13. 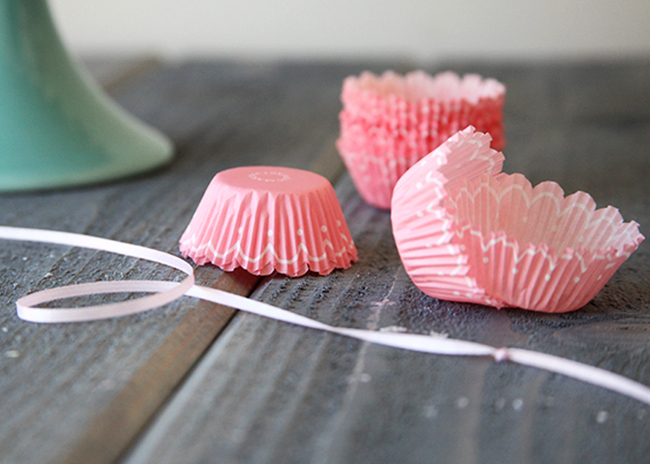 Smoothing as you go, gently stretch the fondant out to iron out pleats and adhere to the sides. You will want to work around the cake, pulling and placing as you go, until you reach the bottom. 14. Give the cake a final "smooth-down" to make sure the fondant sticks and is in place before trimming the bottom. 15. Trim the excess fondant from the bottom with a pizza wheel or sharp edge. 16. Pop any remaining air bubbles with a straight pin and smooth to seal. Use two fondant smoothers. After the fondant is already in place, use one smoother on top and the other on the sides to form a 90 degree angle. Use pressure to create clean, sharp edges. Don't be afraid to put a little muscle into it. You will notice that kneading and rolling does take some work. When placing the fondant on your cake, really make sure it "sticks." If built with care, your cake should be sturdy enough to withstand some pressure when trying to smooth everything out. Make sure your fondant has not dried out. Save yourself the trouble and start with a fresh piece. If not, the edges around the cake will crack. Always cover and put leftover fondant in an air tight container to prevent drying. Cool hands work better than hot. So if you body tends to run on the warmer side, try running hands under cool water (and drying) before you start. 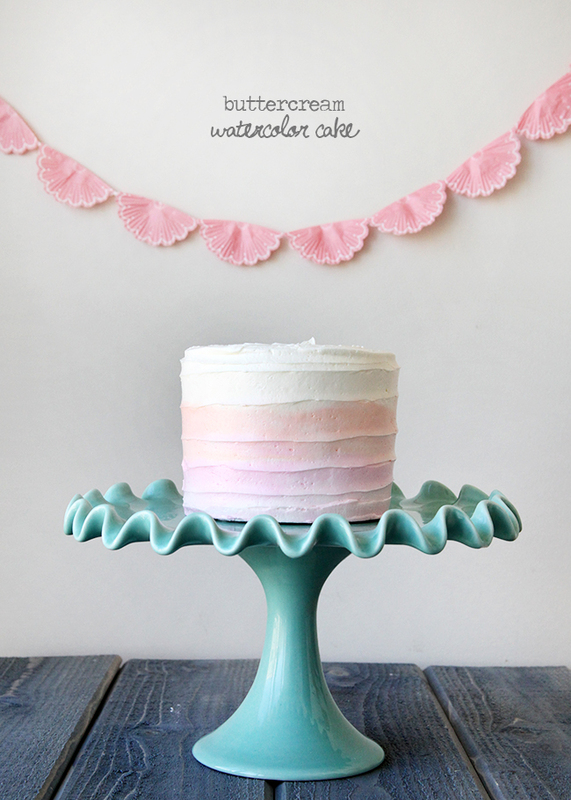 Keep all water and moisture away from fondant while you are working. Water tends to melt sugar, and you will end up with a sticky mess. Use a pizza wheel to trim your fondant. The wheel action prevents pulling like a knife might. Always adhere fondant to a smooth crumb coat of buttercream or ganache. The smoother the crumb coat, the smoother the fondant will be. Cakes should be cool but not too cold when being covered. Blot off any perspiration before placing on the fondant. Measure your cake and calculate how large of a piece of fondant you will need before you roll. Example: If you have an 8" round cake that is 4" tall, you will need a piece of fondant that is 16 inches in diameter. (8" + 4" + 4"
If your piece of rolled out fondant is not smooth and irregular in thickness or shape, start over. It will not get any better once adhered to the cake. In my humble opinion, it is okay to refrigerate a fondant-covered cake. However, I do highly recommend the cake be place in a box to prevent as much "sweating" as possible. When the cake is brought back out to room temperature, the fondant has a tendency to sweat. DO NOT try to wipe the moisture off. Just let it "sweat it out" on it's own. Nearly a decade ago, I enrolled in a watercolor class during summer school at my university. I've always considered myself to be a fairly crafty and artistic person, but let me tell you- watercolor painting is HARD! Making simple designs and blending colors was fun and sort of relaxing, but the detail and artistry that my instructor and some of my fellow classmates used was phenomenal. Needless to say, I knew I was not going to improve all that much in just a short amount of time. However, I definitely left inspired and with a tremendous amount of respect for those that could create beautiful imagery with only a few tools. Years later, I find myself as an artist of sorts- a pastry artist. I may not be that comfortable working on a canvas, but I have learned how to manipulate cake and sugar to extreme levels. 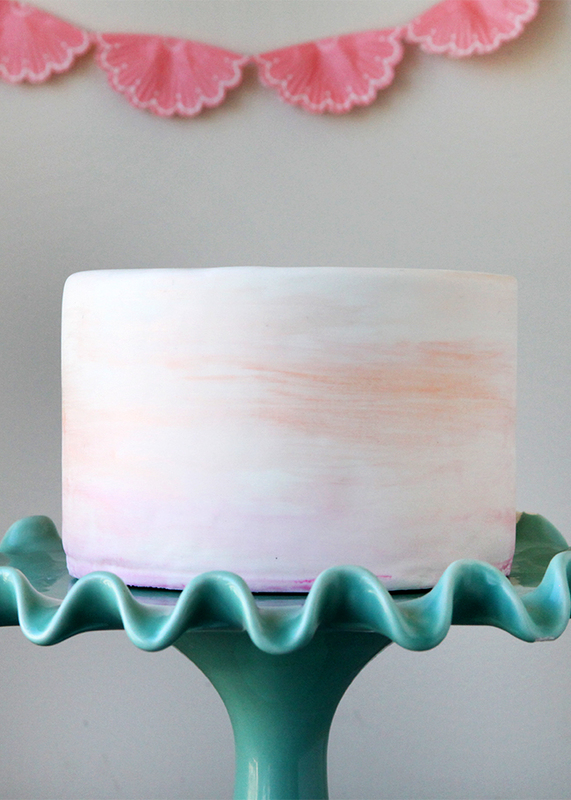 When watercolor details began circulating through the wedding world, I was inspired to incorporate the trend on to cake. I've been able to translate one medium onto two different sugar "canvases." Using different techniques, the watercolor concept works with both buttercream and fondant covered cakes. 1. Torte, fill, and layer your cake layers. 2. 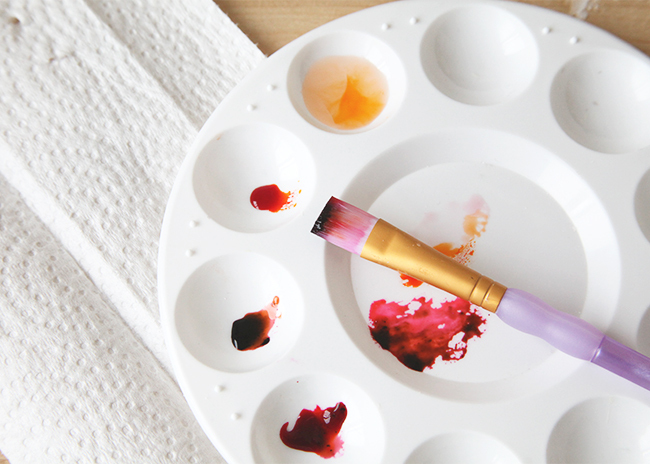 Crumb coat your cake with the lightest color of your watercolor palette. You may find more details on how to crumb coat here. 3. Divide and color your buttercream with gel food coloring. For this cake, I decided to use three different colors: white, pink, and orange. You may use these same techniques with any shades you wish. 4. Starting with the top, add a fair amount of icing and begin to smooth with an off-set spatula. You will want a bit of this color to hang over the edge, so that it can be blended with the other colors later. 5. Working from the bottom up, add "stripes" of color around your cake- one color at a time. For more control, use a small off-set spatula and only a small amount of icing at a time. These "stripes" do not need to be completely even for this design. In fact, I find it looks better if they are not completely straight. I even added back in a touch of white on top for a more blended effect. 6. Repeat the previous step with your second color. 7. Repeat the precious step with your third and/or final color, making sure to connect with the overhang of the first color. At this point, your cake my look fairly sloppy. Don't worry- it will be okay! 8. Using a turntable and flat icing comb or bench scraper, partially smooth out the final coat of your icing. Finish off the top as you would a regular buttercream cake. For more details on how to ice a cake with buttercream, follow the steps here. 9. To create the swirly, textured effect, hold a straight metal spatula parallel to the cake. Starting with the bottom, touch the tip of the spatula to the cake. Keeping the spatula connected, spin the turntable while spiraling the spatula to the top of the cake. Finish off the top with a spiral. For more instruction, follow the tutorial here. A decorating technique that I love is that you can literally paint on fondant. When mixed with a clear alcohol, like vodka, gel food coloring becomes edible paint. The alcohol in the vodka evaporates much faster than any other liquid, leaving the beautiful color behind. Just remember, a little color goes a long way! 1. Mix vodka and gel color in a paint palette to create the colors and shades of your choice. 2. Paint directly onto the fondant cake. For this project, I used a medium flat-edged brush. Feel free to test the color on a spare piece of fondant. 3. If you find that your color is too saturated, add more vodka to your brush and blend. Like any watercolor painting, the more liquid, the more the colors will blend and swirl. However, the more liquid, the less control you will have. With this design, that's completely okay! 4. Make a major error? Use a q-tip soaked in vodka to clean up any mistakes- just don't rely on this too much or your fondant finish will be affected. 5. Allow to dry before handling.